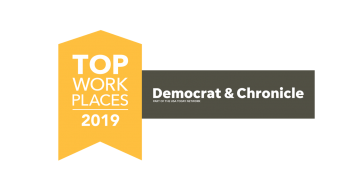 M/E Engineering was recognized as the #12 Top Workplace in Rochester, by the Democrat & Chronicle! The 2019 Top Workplaces winners were announced at a special ceremony on March 27th, at the Rochester Riverside Convention Center. The ranking is based solely on survey about the workplaces completed by employees. Thank you to all of our exceptional employees that made this possible! In addition to the ranking, employees who attended the celebration received the Spirit Award for enthusiasm, dress, and celebratory props used during the event.